Over the past few years, I have been watching eBay and Craigslist for a set of 1970s Slingerland drums in good shape for a reasonable price. While I've picked up a few Sound King COB snares along the way, most of the used Slingerland drumsets I saw were either too pricey or in poor condition. Until now. A few weeks ago, a 70s Slingerland drumset with a beautiful violin red wood finish, 24-inch bass drum, and 12-, 13-, and 16-inch toms appeared on eBay. 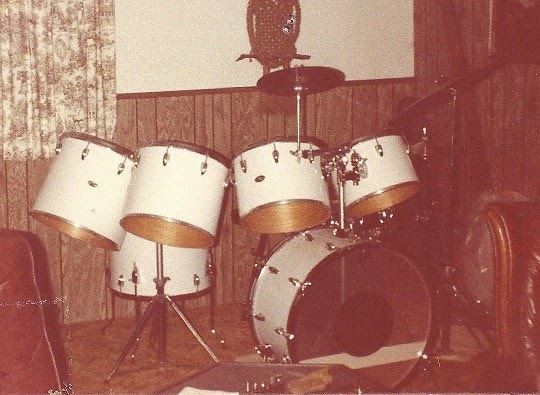 According to the listing, the drums included all the original parts, and from the photos, the finish on all the shells appeared to be in excellent condition. I noticed that the seller was also offering a 14-inch floor tom in the same finish, so it was a great opportunity to purchase a vintage Slingerland kit with my typical two-up, two-down tom configuration. I decided to go for it. When it arrived late last week, there were no disappointments--Slingerland's revered maple-poplar-maple 3-ply shells with reinforcement rings, 30 degree roundover bearing edges, beautiful original finish, bass drum hoops with the chrome inlay intact, and the famous stick saver hoops. 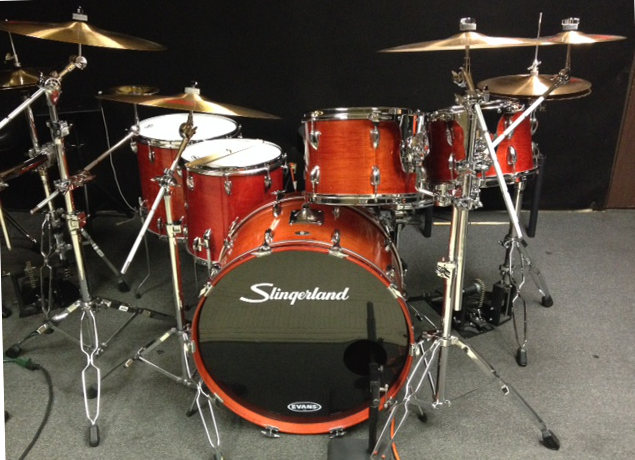 The kit's violin red wood finish first appeared in the 1976 Slingerland catalog, and its serial numbers are in the high 230,000s, indicating that this is a 1975-1977 vintage kit, most likely 1976. While this is going to be a player's kit rather than a museum piece, I decided against any upgrades that would prevent me from restoring the kit to original condition. First upgrade: Heads, of course. The drums arrived with Remo Pinstripe batters all around, which decay too quickly for my tastes, but do produce the dull thuds typical of 70s pop/rock recordings! Each tom is now outfitted with an Evans coated G2 over a clear G1. The bass drum now wears Evans EMAD2 and EQ3 resonant black heads. The EMAD2 does a good job controlling the boom emanating from the 24-inch bass drum. A Remo Double Falam Slam Patch protects the EMAD2 from solid beaters, and a Slingerland bass drum decal adds a vintage touch to a modern bass drum setup. Next upgrade: Suspension tom mounts. While Slingerland's Set-O-Matic tom mount system is quick and convenient, I prefer to position my rack toms closer together, and off of the bass drum. After researching my options, I went with Gibraltar's SC-USS Universal Suspension Mount. It is similar to Gretsch's current suspension tom mounts, with a smaller profile and three-point suspension design. Threading through two tension rods instead of four, the Gibraltar mount stays out of the way when you position two rack toms close together from a single stand. Using spare PDP tom brackets I already had, installation of the Gibraltar SC-USS was a snap. For a cleaner look, and to reduce the weight of each rack tom, I decided to remove the existing Set-O-Matic tom brackets and hang the Gibraltar mounts over the holes left behind. This worked out better than I expected. I borrowed large washers from the Set-O-Matic brackets to help spread the new load the Gibraltar suspension mounts place on the thin 3-ply shells at the lugs. I also reinstalled the bottom Set-O-Matic mount screw on each drum, as that is the spot where the Gibraltar mount's rubber tip presses against the side of the shell. To restore the rack toms to original condition, I simply remove the Gibraltar mounts and reinstall the Set-O-Matic tom brackets. The first thing I noticed when playing my "new" Slingerland kit after these upgrades is that the rack toms really opened up with the suspension mounts. The Gibraltar SC-USS is an excellent solution for vintage rack toms with traditional mounts that limit positioning options or choke the sound. The warm tone of the toms caught my attention as well, thanks to the rounder Slingerland bearing edges paired up with two-ply coated G2 heads. And, last but not least, the 24-inch bass drum booms with authority, but the EMAD2 head (using the thicker of the two foam rings) keeps it under control without the need for a pillow--or the classic felt strips across the head approach as shown in the 1976 Slingerland catalog! The right set of vintage drums can provide a new dimension to your sound. The warm sounds of classic Slingerland shells, the 13-inch rack tom, and the 24-inch bass drum are perfect for classic 70s rock. A word of caution, though, before you consider the purchase of a vintage kit: Each U.S. vintage drum maker peaked at a different time, during which it built quality shells with a signature sound still sought after today. However, as each party came to an end, shell quality declined, and the sound of the great American drumset declined with it. Look for vintage drumsets with the maker's signature shells--3-ply shells with re-rings in the case of Slingerland toms and bass drums. Otherwise, I think a modern mid-level kit is a better choice. Very nice. I believe I have this same kit except with 24,13,14,18. This is only the 3rd one in violin red I've ever seen. Great article. I have a similar violin red kit I bought new in 1978. The finish is nicked up and faded. Do you know if it is possible to sand down the shell and re-stain the drums? Thanks.